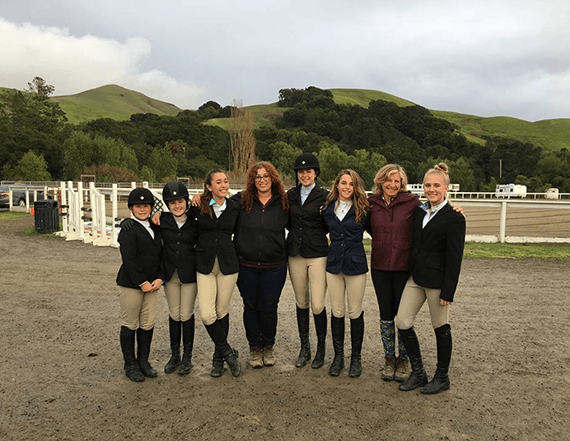 Welcome to the Five Star Equestrian Interscholastic Equestrian Association Team. Support the goals of the Interscholastic Equestrian Association. Build confident and skilled riders through quality training, team support and exposure to competition. Introduce new riders to the equestrian sport. Receive Potential Scholarships for our riders. College scholarships are currently available from the Interscholastic Equestrian Association, United States Pony Club, and others. Enhance College Attractiveness. Even if the rider decides not to participate on an equestrian team in college, participation at the High School level makes available leadership opportunities and responsibilities, which can be tremendously beneficial on college applications. parents and riders to work with in addition to a great facility. Five Star Equestrian congratulates New Members and Returning Members to our team and looks forward to a fun and successful year! View our past teams, accomplishments, upcoming events, and much more! A special thanks for all those making this such a rewarding experience for all the team members! opportunities. Also, there are opportunities for these students to earn scholarship money. • To promote the equestrian as an athlete. • To provide students with organized competitive opportunities. • To promote the IEA among middle, and secondary schools. • To provide students with opportunities for further education equine sports and other equine-related matters. • To encourage liaison with USA Equestrian, Inc., IHSA and other interested bodies. mounted and non-mounted equestrian programs. • To establish and enforce IEA rules, standards and policies. • To evolve with the continuing progress of equestrian sports. and education on matters related to the horse industry and all segments thereof. The unique aspect of these competitions, both at the local and national level, is that none of the riders will supply their own horses or tack. Instead, the horses, saddle and other tack are all provided to the students at the show. The host team arranges for the horses and equipment. IEA is comprised of multiple Zones located regionally. Zones are divided into smaller Regions. Five Star Equestrian is in Zone 10, which currently includes teams from Nevada, California and Hawaii. 5pm on Sunday. However, we do attend shows that are back to back over one weekend. These run 7a to 5p on both Saturday and Sunday. Practice Meets: We host five (5) team meets at our facility per season, one (1) per month starting in September. These provide an opportunity to practice as a team and bond. These generally run from 8am-10am, however, riders do need to arrive at 7:30am to tack up horses. year by a direct payment instead of the activity. We strongly encourage you and your rider to participate in the activities and support the opportunity to do some team bonding! Hosted Shows: Our team is required to host or co-host two (2) shows (minimum) each season. These require help from all parents and riders, both in planning and at the shows. Each rider can compete in a maximum of five (5) shows during the regular season, September through January. Team will attend more than five (5) shows to allow everyone the opportunity to compete in five shows. There are four (4) levels of competition for Middle and High School Team riders ranging from beginning to varsity riding on the flat to jumping 2’6” fences. Team coach place riders in the appropriate classes (over fences & flat classes) based on the rider’s skill level and the needs of the team. IEA recommends, since this is catch riding, that a rider show in a lower over fence class than they are used to showing in on their own. For a new rider who has shown in a rated USEF hunter/jumper show in the past, the most current show listing and results must be presented at the time of registration. Returning riders and those who have not shown in a rated show do not need to do this. Riders usually compete in a single level for both flat and over fences classes. Regionals are held locally in late February or early March and are run over 2 days on the same weekend. If a rider accumulates 15 or more points in a season they qualify to compete in Regionals. If a team accumulates 20 or more points in a season, the team qualifies to compete in Regionals. The Coach will decide the riders who will compete in each class for the team at Regionals based on point accumulation, team spirit and participation, as well as overall skill level. Coach has final say. Typically, the team placements remain unchanged once chosen for Regionals. However, the coach may substitute team members for Zones and Nationals. A rider may qualify individually and also be chosen as a team representative. This means they will compete twice, in both the individual and team rounds. Zones may be held anywhere in Zone 10 (even Hawaii) and will run over 2 days on the same weekend. Individual and team competition may be on either day based on schedule. Advancing to Nationals is done similarly. Nationals rotates between the Zones, but typically is held on the East Coast. Riders are responsible for their own travel costs for Zones and Nationals and also split the Coach’s travel costs for Zones and Nationals. The Team may be able to assist in Coach’s travel costs through fundraising as well. This is determined year by year. IEA does not require participants to own a horse. Horses are provided by the show hosts. The horses are pooled based on what classes they are appropriate for and randomly assigned to riders through a blind draw. Riders are judged on their own ability and are not supposed to be penalized for horse error. All IEA competitions are judged by IEA registered judges. These are agreed upon by all teams who are participating in each show. b. Please email me a scanned version of the signed rider application & proof of payment so that I can complete the registration process. b. $240/month – for riders qualified for only Flat Classes – due on the 25th of each month starting with August 25th (Regular season: September 1 through January 1, Region Finals: February, Zone Finals: March, etc.) to continue membership – includes up to 1 lesson/week during season – no make ups available. 3. Class Fees: $40/class at regular season shows, $50/class at finals (regional, zone, etc.). Show Attire: Rider must come to shows in complete show hunter attire (see requirements on next page). If you are interested in second-hand apparel, please let our Manager know. be identified. This may or may not keep some riders from participating. Delays during the day may occur due to re-rides, weather issues, horse issues or rider issues. Expect the show days to run from 7am to 5pm, although some shows will end earlier. Over Fences classes run in the morning and Flat classes run in the afternoon. Classes run from the highest level to the lowest in each. are discouraged after a class. Parents can help with making sure that riders and coaches have food and water throughout the day. Parents will play a big role at co-hosted and hosted shows as well. Please see “Expectations of Parents and Riders” section. The FSE IEA Team will practice, compete, support each other and win or lose as a TEAM! Practices. Any violation to this policy may lead to expulsion from the team. The IEA Team Captain and/or Co-Captain position is open for a high school team member who would like to assume a leadership role on the team. Team captains are responsible for attending and assisting at most, if not all, competitions and events, building team spirit, and supporting fellow team members throughout the season. This position is open for anyone who has NOT already assumed the FSE Captain or Co-Captain position the prior year and priority will be given to new applicants who qualify. Captain and Co-Captain Positions are selected based on your IEA experience, essay, horsemanship experience, team spirit, and respectful and positive attitude. Must submit a 250-300 word essay explaining why you think you could make a good Team FSE IEA Captain. Explain what you value most about IEA, your goals as Captain and how they would add to the team in a positive way. Prepare and bring a “spirit” item to each show (good luck token, treat, message, etc. to motivate and encourage teammates). Be available ringside and in the warm up area to assist with boot polishing, supporting a teammate, and grabbing last minute items like crops and spurs. Plan, purchase/make and present end of year gifts for teammates. Conduct oneself in a mature, friendly, supportive manner to all teammates, administrators, coaches, fellow teams and others associated with FSE IEA. Please complete the application (PAGE 13) and turn into Cassandra or Leah anytime before September 15th. Then write and turn in your essay (described above) via email to Cassandra and Leah at: 5starequestrian@gmail.com. Deadline for essay is September 15th.